When MacKenzie Tuttle met Jeff Bezos, her co-worker at hedge fund D.E. Shaw, he was definitely not a billionaire. He wasn't even a millionaire. As a mid-level executive at a newly-launched fund, his net worth probably didn't even top $100-200,000. Fast forward a few decades and Jeff Bezos is a billionaire… 136 times over. Not long after getting married, Jeff and MacKenzie quit their jobs and drove across country to launch what would become Amazon.com. Jeff wrote the business plan in the passenger seat as MacKenzie drove and spit-balled ideas for what would eventually be a $1 trillion company. It took just five years from that road trip for Jeff's paper net worth to hit $1 billion for the first time. One year later, at the peak of the doctom bubble it topped $10 billion. By July 2015, his 16% stake in Amazon was worth $50 billion. By July 2018, his stake was worth $150 billion. In mid-September 2018, Jeff's net worth hit an all-time high of $170 billion. As you can imagine, over those 25 years Jeff and MacKenzie used their astonishing wealth to acquire an impressive collection of assets. An impressive collection that must now be divided in half since the couple has made the decision to divorce after 25 years. Obviously the biggest asset they'll have to divide is Jeff's 16% stake in Amazon, roughly 78.4 million shares. But that's actually easy to divide. If MacKenzie gets half, they'll simply transfer around 39.2 million shares to an account she controls. It will be much harder to divide their other assets. Let break those down. Space exploration company Blue Origin – Jeff reportedly invests $1b of his own money into Blue Origin ever year! Which of these assets would you fight for? Personally, I think I'd fight hardest for the jet! 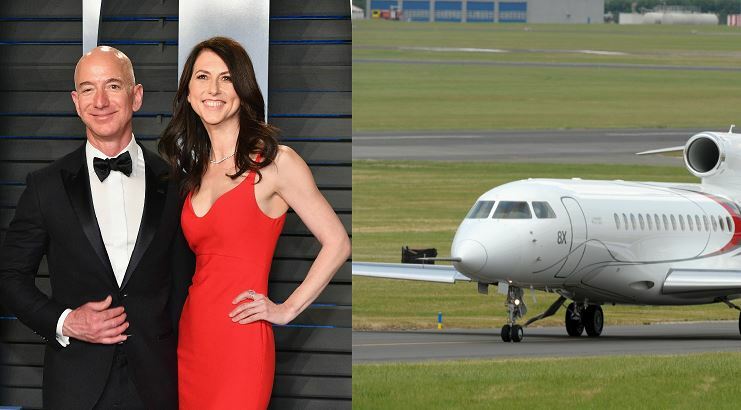 Or maybe I'd make Jeff buy me a brand new $65 million G650. One thing is for certain, a couple of Seattle lawyers are about to get rich!